Craniosacral Therapy is a gentle massage therapy technique focusing on the bones in your skull, spinal column, sacrum, and the fluid that runs throughout the body and surrounds, bathes, and cushions both the brain and spinal cord. This technique is noninvasive and uses natural and rhythmic movements. Cranial bones move in miniscule amounts responding to the production and the absorption of the cerebrospinal fluid. When you experience a head trauma, whiplash, or other severe injuries, it can compromise your cranial bone movement. This can result in: headaches, vision issues, ringing in your ears, or even dizziness. Craniosacral Therapy restores the natural and normal movements of your cranial bones and cerebrospinal fluid. Craniosacral Therapy involves gentle, rhythmic movements while the practitioner comfortably holds the head. During this type of massage therapy, the client will remain clothed and lies comfortably on the massage table on their back. The practitioner will place their hands along the various cranial sutures removing any subtle restrictions to the craniosacral fluid flow, restoring and promoting a healthy and balanced movement to the cerebrospinal fluid throughout the system. The sacrum is also gently held and restored to proper positioning, helping to decompress the lower back. Why should I be interested in Craniosacral Therapy? What Are the Benefits of Craniosacral Therapy? How Much Does Craniosacral Therapy Cost? 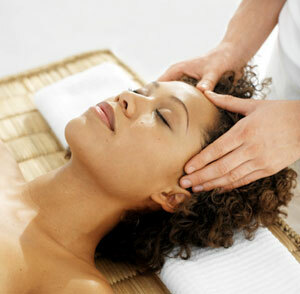 The Craniosacral Therapy can be completed as an independent form of massage or integrated into a bodywork session.